I found out I was going to be a mommy again on 1/25/12. It seemed like too good to be true. We had been trying for almost a year. 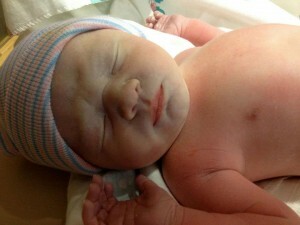 Dexter was born at 2:14 a.m. on 9/20/12. He was 7 lb. 8 oz., 19.5 inches with Apgars of 9 and 9. The nurse got him all cleaned up and put one of my cloth diapers on him.